Pebble 2.0 is here... and so is Canvas 2.0! You may have noticed that Canvas hasn't been updated much over the last few months. That's because I've been working exclusively on the Pebble 2.0 version. Thanks to everyone who has been beta testing Canvas over that period, it is ready for release. There are lots of cool new features made possible by Pebble SDK 2.0, as well as several months worth of bug fixes and improvements! The first thing to say is: The existing 1.x version of Canvas will not work on Pebble 2.0 (and the 2.0 version of Canvas will not work on Pebble 1.x! ), so make sure that you upgrade both your Pebble (Android app and firmware) and Canvas. You've been asking for it since the first release, and it is now possible... you can see your watch battery status in Canvas (find it under Time/Date/Pebble status)! 2.0 Also allows you current screen to be stored persistently on the watch, so that it can be displayed without loading from your phone after you switch apps/faces and return to Canvas (note: image storage is not supported). SDK 2.0 also allows the freedom to dynamically allocate memory. What that means for Canvas is that more layers are allowed (up to 25!) and images can now be animated (animation duration can also be set, and more directions are available). 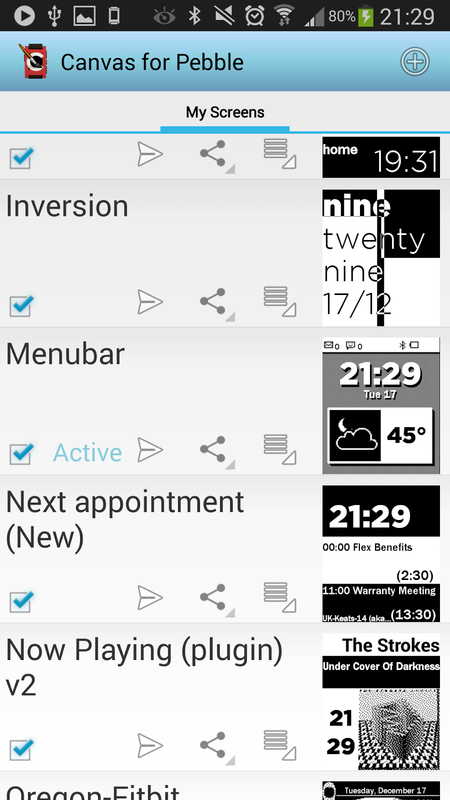 This has also enabled the addition of analogue clock layers, and the really cool inverter layers! Layers can now be dynamically re-sized based on content, allowing the creation of some really cool effects (see the Inversion example screen for a demo). Share and discover: The Canvas Screen Store! Built right into Canvas, you can now see hundreds of screens that other users have designed - and you can upload yours for everyone to see. You can deep-link to Screen Store entries to share them with your friends. You now have a choice: install the Canvas watch-face, or the Canvas watch-app. 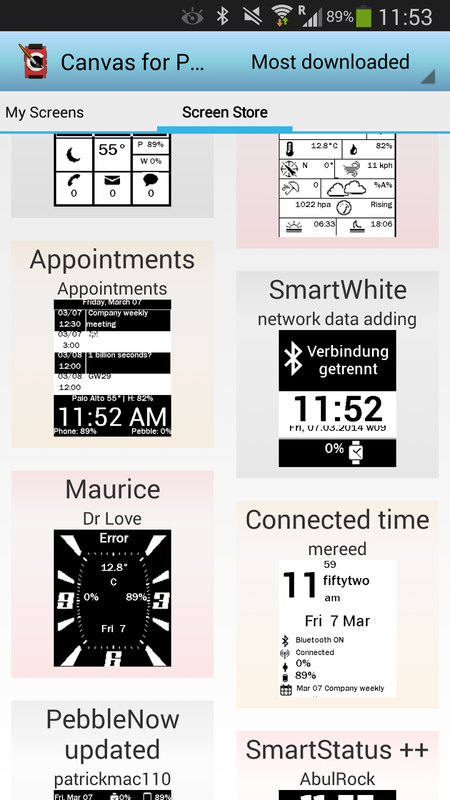 The face is the the classic Canvas, but the app instead appears under the Pebble main menu (i.e. it's not a watchface), and allows interaction. In 2.0, when the app version is installed, you can switch between Canvas screens right from your Pebble using the up/down buttons. Yahoo! is now the default provider for Weather data (you can still choose OpenWeather), and lots of new weather fields have been added (including today's forecast, Beaufort, and lots more). You can also enter a fixed location via name or lat/lon. You can choose to hide all-day/started calendar events, and some new fields have been added (e.g. calendar name). All bundled images (including weather and phone state) are now vector-based, meaning that they should scale better to your chosen size. They are also all now 1-bit black/white, just like the Pebble display. The Pebble preview on the editor screen can now be enlarged, and you can also now place layers overlapping the edge of the Pebble screen. The editor window is tabbed to better navigation, and there is also now a copy layer function to save time. You can also enter longer format strings in the editor to allow for conditionals (the text layer length limit on the watch has not changed). The screen preview has been optimised, and you will also now not lose your changes when you rotate your device! Would it be possible to add two more appointment tags? - Event Duration (Minutes) – giving the minute part of the appointment duration, to be used in conjunction with the %ED tag to give something like 1:15 hours. The latter is probably less useful, but the former one would be relevant for short meetings and meetings not taking full hours. I can't get a conditional statement working worth my life. I want to make the battery percentage of the phone to only appear if it is less than 30 but this fails. Would love to see some extra options/features for handling content overflow. In particular, horizontal and vertical scrolling. If this is open source, I might be able to provide patches. How do I upload my watchface to the Screen Store? The Screen Store profile has "Account identifer" blank and the Upload button doesn't do anything when pressed? It took me a while to reproduce the issue in enough scenarios to be sure I wasn't just running out of space (though that shouldn't matter as the text was right-aligned), but the two-digit minute display (%M) is getting incorrectly formatted. When the second digit is a zero, it gets dropped. Correction: when both digits are zero, one of them gets dropped.